Mikhail Aleshin is in a serious but stable condition in hospital, having been diagnosed with multiple injuries following his Fontana IndyCar practice crash. The Russian was airlifted to Loma Linda Medical Centre following the accident, in which he was briefly knocked unconscious. A statement from IndyCar medical consultant Dr Terry Trammell said Aleshin had been "diagnosed with fractured ribs, a broken right clavicle [collarbone], a concussion and chest injuries. "He was admitted to the hospital and listed in serious but stable condition." 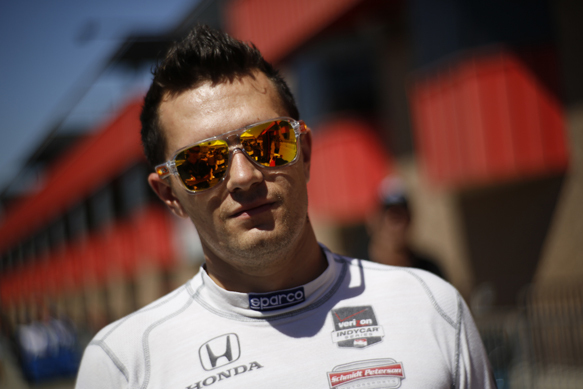 Aleshin's crash happened in the short evening practice session that followed Friday's qualifying for the IndyCar season finale at the Californian track. The Schmidt Peterson driver spun at high speed and tangled with Ganassi's Charlie Kimball, sending Aleshin's car into the catch fencing. Marco Andretti then hit wreckage from the incident. Kimball was checked at the Fontana track's medical centre and cleared to drive in Saturday night's race.